Compatible with LG’s 2013 Smart TVs (LN5700, LN6150, LA6200, LA6900, LA7400, LA8600 and PH6700 series of TVs). 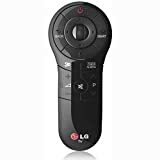 Designed to enhance your LG Smart TV, the AN-MR400 Magic Remote makes it easy to navigate your TV’s menus by simply moving your wrist. Point and click using the scroll wheel, the Magic Remote is like a wireless mouse for your TV.